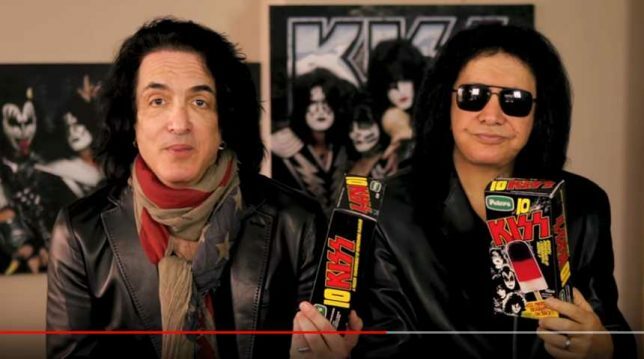 KISS and its hustling frontman Gene Simmons continue to raise the rock music merchandising bar, licensing thousands of products ranging from banal to bizarre. KISS my buns? 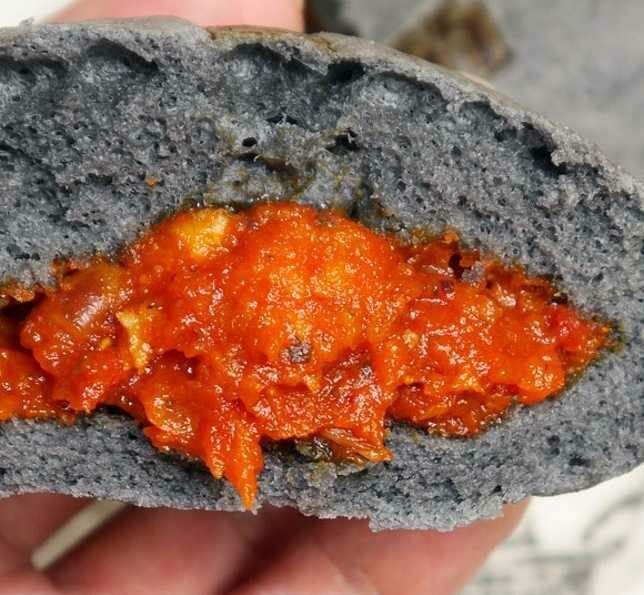 Only if they’re KISS Super-Spicy Chili Tomato meat buns, because one would naturally expect KISS-branded steamed meat-filled buns to be… Hotter Than Hell! 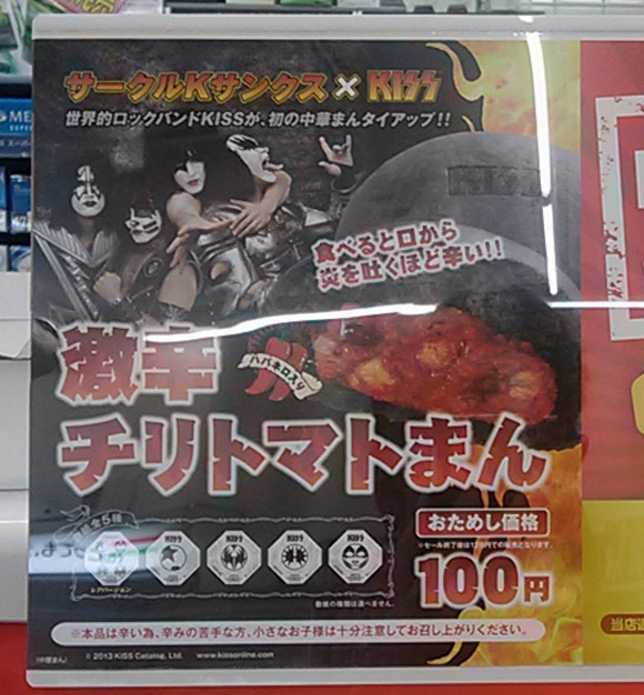 Partnering with Japan’s Circle K Sunkus convenience stores (strange things really are afoot at the Circle K) to promote KISS’s late-2013 Japanese concert tour, these frighteningly lava-like buns cost $1 each and were packaged in one of five collectible paper wrappers: one for each band member plus one more featuring the entire band. 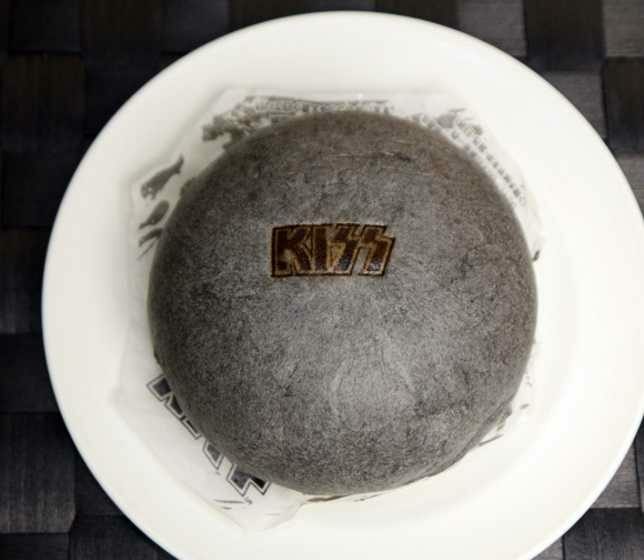 The buns are embossed with the well-known KISS logo and their odd grey coloration comes from edible bamboo charcoal. Inside, super-spicy habanero chilies add a fitting dose of demonic heat. Sorry, Red Hot Chili Peppers, looks like Gene Simmons & Co stole your thunder. Kudos to Rocketnews24 for reporting on this weird but tasteful marketing gimmick. What’s cosplay without prosthetics and what’s a Gene Simmons Demon outfit without a KISS Inflatable Tongue? In fact, forget the cosplay and outfit, just go with the tongue – always a winning strategy (unless your name’s Harvey Weinstein). 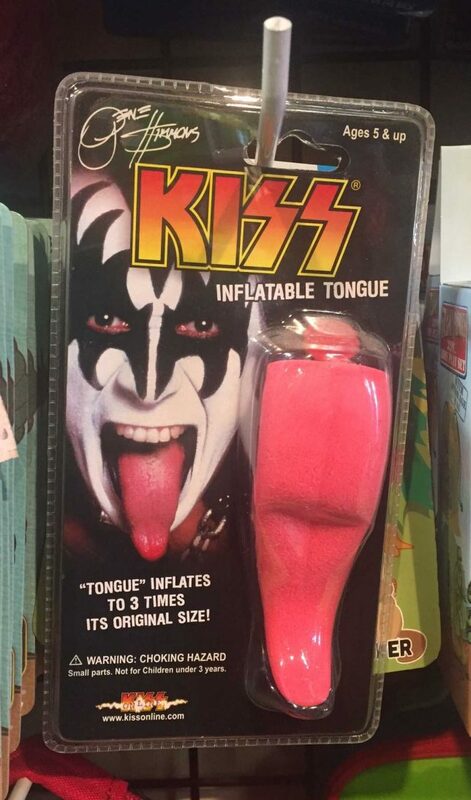 This official KISS product supposedly inflates to 3 times its original size… think The Grinch but MUCH more disturbing. The package also bears a cautionary “Warning: Choking Hazard” blurb though were not sure if the user or the usee is at risk… maybe both. 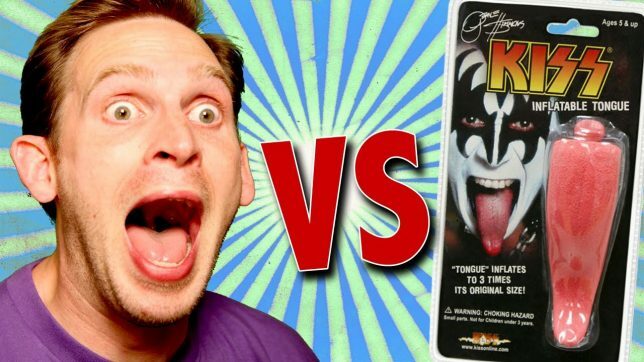 If you dare, check out this video from Scott Vs Box as our hero, Scott, unboxes the tongue. Does Putin know about this? Never mind, he’s probably got an autographed set of his own. 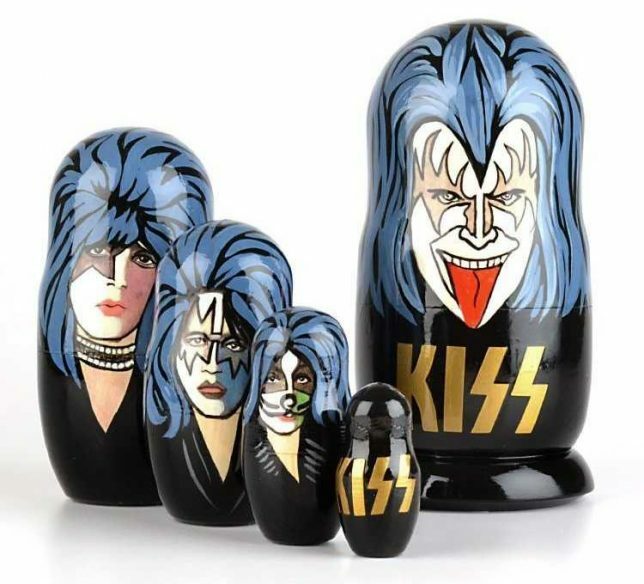 KISS Rock And Roll Nesting Dolls take the classic Russian Matryoshka concept to a very strange universe indeed. One wonders what goes through the minds of the aging babushkas employed to hand-craft these “stunning glossy” dolls, though it’s probably not the extended version of “Beth”. Offered by The Russianstore, est. 1992 – just after the fall of communism. Thanks, Yeltsin. 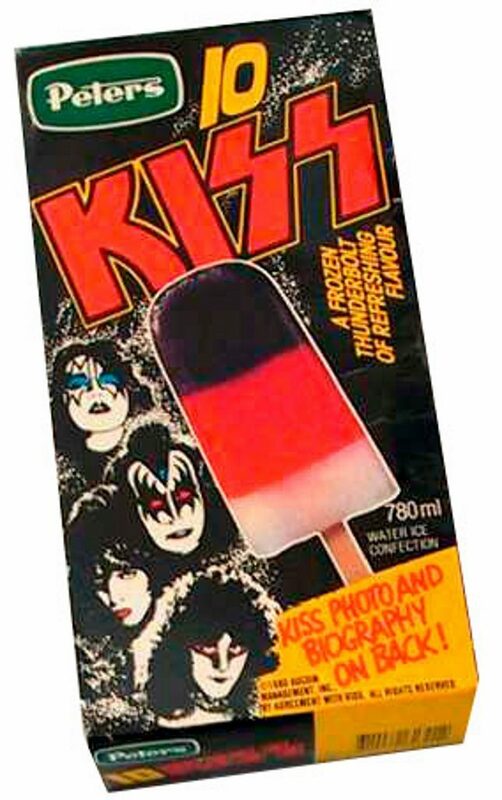 You’ll have to go all the way back to 1980 (and all the way to Australia, no less) to find KISS Ice Blocks, “a frozen thunderbolt of refreshing flavour”. 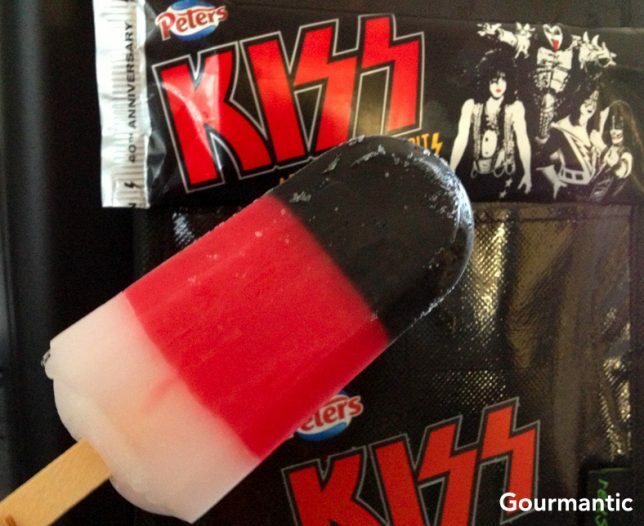 Manufactured by Peters Ice Cream, the way-cool bars did NOT feature the face of “Cat Man” Peter Criss, who had been fired from the band before KISS left for their hugely successful KISS Monster Tour of Australia and New Zealand. Instead of Cat-Man Criss, Eric “The Fox” Carr peers out from the 10-pack box. As for the ice bars themselves, they feature bands of frozen cola, raspberry and lemonade. Yum! Check out a make-up-free Paul and Gene plugging the bars in this short (1:22) official video from Peters.